The first and most important part of this Shashlik recipe is the marinade. Mince the white onions (or better, use your food processor), chop up the chive, and mix all of the ingredients in a large enough bowl. Add salt and pepper to taste. Place the meat in a ziploc bag. Use separate bags for beef and pork if you are doing both. Pour the marinade inside the bag(s), seal while pushing the air out, and “massage” it to get the marinade everywhere. Then let the meat marinate in the fridge for 4 hours. Next, prepare the Shashlik kebabs. Alternate between skewering meat and onion slices. 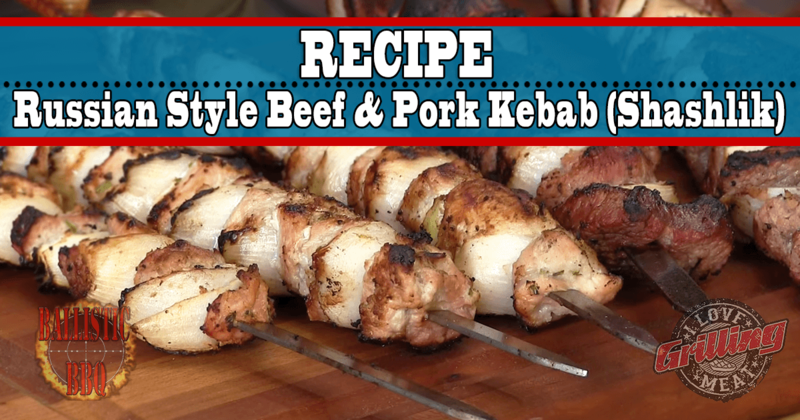 Once you have the kebabs ready and your pit set up for grilling, you can start cooking! To ensure even cooking throughout, make sure to rotate frequently or move it to a colder spot if necessary. When done, dive right in and enjoy your Russian style Kebab! Mini Bacon Bomb Recipe To Die For!